The Milky Way Galaxy is the one that contains our Solar System. Although, obviously, no-one has seen a bird's eye view of it, it is thought to be a barred spiral. Here we have an artist's impression of how it would look from above, with the various spiral arms labelled, together with the position of our Sun. In the grand scheme of things, it is a pretty average galaxy, about 100,000 light years in diameter, with an average thickness of 1,000 light years and containing anything from 100 to 400 billion stars. The Sun and our Solar System lie around 27,000 light years out from the galactic centre, which takes the form of a bulge some 10,000 light years in diameter that contains one or more bars. The absolute centre of the Milky Way Galaxy is a region of intense electromagnetic radiation that it thought to be a supermassive black hole, named Sagittarius A*. Using the Cosmic Background Radiation as a frame of reference, the Galaxy is moving at around 345 miles per second, heading in the general direction of the Great Attractor. 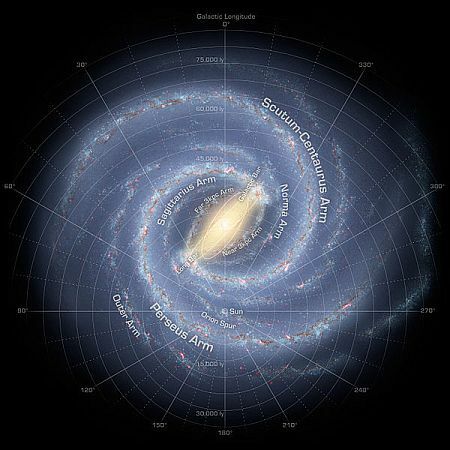 The rotation of the Milky Way Galaxy is a more complicated subject than you might expect. All stars within it seem to orbit the galactic centre at the same speed, no matter how far out they are. This violates Newton's law of gravitation, which implies that outlying stars should orbit more slowly than their more central counterparts. The only explanation is the presence of some unseen, undetectable substance - the famous "dark matter". Our galaxy, like every other, is interlaced with the stuff. The next conundrum is that the stars take a certain time to complete one revolution, whereas the time taken by the spiral pattern itself is completely different. Our Sun takes around 240 million years to make one orbit. The spiral arm pattern, on the other hand, rotates once every 50 million years. This discrepancy is due to something called "density wave theory". Previously, astronomers thought that stars were fixed in position within the arms. Unfortunately, such an arrangement would result in the spirals becoming ever more tightly wound until the galaxy became just a blob. In order to maintain the spirals, stars have to move in and out of them. They are, the theory states, merely areas of higher density. There's a lot of intricate mathematics associated with this theory that I don't think we need go into. As if that wasn't enough, the bar pattern at the centre has its own, different rotational period - a mere 16.5 million years. The Milky Way Galaxy has a total of nine arms that have all been assigned names. 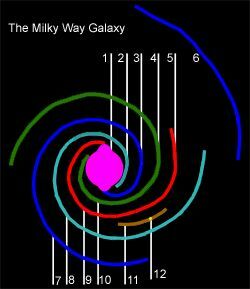 In this graphic, number one points to the galactic core and 12 shows the place of our Sun. We'll now deal with all the arms in turn. For many years, astronomers have known that there is a small arm, very close to the galactic centre and lying on the side closer to us. It was termed the Expanding 3-Kpc Arm, since three kiloparsecs equal 10,000 light years and that is how far the arm is from the centre. It is also known to be expanding outwards at a rate of 33 miles per second. Because other galaxies tend to be symmetrical, it was long thought that there might be another 3-Kpc arm on the far side of the galactic centre. In 2008, astronomers Tom Dame and Patrick Thaddeus, of the Harvard-Smithsonian Center for Astrophysics, discovered evidence of its existence. The new arm was a mirror image of the original one and was christened the Far 3-Kpc Arm. 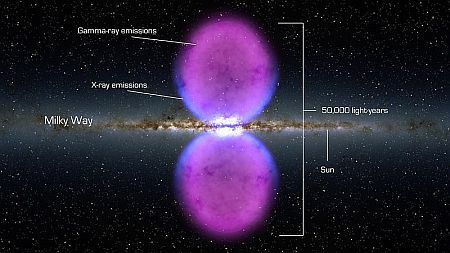 Each arm is thought to connect to opposite ends of the central bar and contains the mass equivalent of 10 million suns, mostly in the form of gaseous hydrogen. This is a relatively minor arm, quite close to the galactic centre. So called because it appears to pass through the constellation Norma, it has a radius of about 50,000 light years. This is a long arm that begins as the Scutum Arm then changes to the Centaurus Arm. It is a long streamer containing stars, gas and dust. 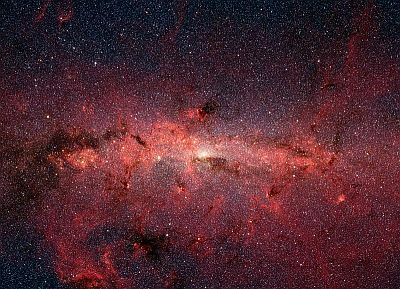 At the point nearest to the centre of the Milky Way Galaxy there is a very busy area of star formation. During the first decade of the 21st century, huge clusters of new stars were discovered in this area, including 40 red supergiants. Once again, a long arm that starts with one name and changes to another. It is considered a minor arm, situated between the major arms Sctutum-Centaurus and Perseus. "Minor" arms are defined as consisting mainly of gas, with only occasional pockets of young stars. This particular arm features a great number of HII regions, making it the most pronounced arm of the Milky Way Galaxy. This is one of the two major arms of the Milky Way Galaxy. With a radius of over 30,000 light years, it is thought to be 6,400 years away from our Solar System. The arm contains a significant number of Messier Objects, including the Crab Nebula. This minor arm of the Milky Way Galaxy contains our Solar System, which is situated on the inner rim about halfway along its 10,000 light-year length. There has been speculation in 2013 that the arm actually might be part of the Perseus Arm, but this has yet to be conclusively proved. It contains many famous astronomical objects, such as the stars Betelgeuse, Rigel, Orion's Belt and the Pleiades, plus the Orion Nebula. This is the central bulge of the Milky Way Galaxy and is thought to contain a stellar bar that could be anything from 5,000 to 15,000 light years in length. Some astronomers have speculated that there is a second bar, nestling within the first. Any study of this area using the visible light spectrum is impossible, due to clouds of interstellar dust between us and it, literally obscuring the view. Using other parts of the spectrum, however, yield spectacular results. This fine image, showing the immense concentration of stars at the centre, is an infra-red view taken by NASA's Spitzer Space Telescope. The central bar features red giant stars and a huge amount of molecular hydrogen. It is an area of intense star formation, making it, by far, the brightest part of the whole galaxy. Right at the very centre of the Milky Way Galaxy, there is thought to reside a powerful radio source, otherwise known as a supermassive black hole. This is the name given to this black hole. It has been estimated to have a diameter of around 27 million miles. Whereas the Spitzer telescope had produced amazing images, NASA were able to take things a step further with NuSTARS. This telescope was the first to obtain actual images of the black hole and even capture it emitting a flare as it swallowed up matter. Here we see NuSTAR's images, superimposed on the original Spitzer image. The frames down the right hand side show the incidence of the flare, captured during a two-day observation period. 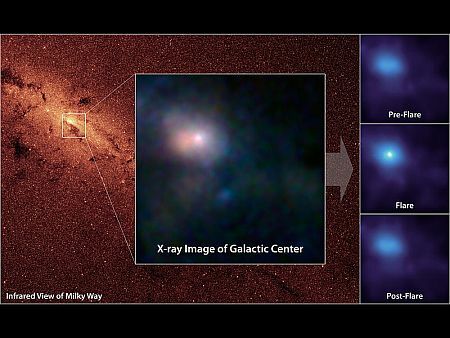 In 2011, a previously unknown feature of the Milky Way Galaxy was discovered. Yet another NASA space telescope came into play. The Firmi Gamma-Ray Space Telescope observed two massive galactic structures, emanating from the centre of the Galaxy, extending north and south from the galactic plane. They are huge, extending 25,000 light years in either direction. Consisting of high energy plasma as the result of both X-ray and gamma ray emissions, their cause is still the subject of debate. One idea proposes that they are the result of collisions of dark matter particles, annihilating each other. The result may be charged "normal" particles, travelling at speeds up to one-third the speed of light. Another idea is that they might be the result of a particle jet from Sagittrarius A* and yet another proposes they might be the fallout from an intense burst of star formation. At any rate, they exist and have been called "Fermi Bubbles".